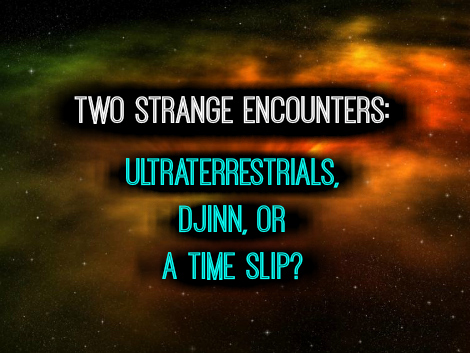 Two Strange Encounters: Ultraterrestrials, Djinn, or A Time Slip? These account were forwarded to me by my friend, paranormal author & researcher Rosemary Ellen Guiley, and are posted at her website Visionary Living...Two Strange Encounters: Ultraterrestrials, Djinn, or A Time Slip? In the summer of 2000, my cousin and his friend, both 11 years old at the time, were riding their bicycles. It was in the evening on a Sunday night; they live in a very small town so it’s safe for children to be outside at night. Anyway, they were by the town park where they saw a figure seated beneath the pavilion. This was highly unusual as the park was usually empty at this time. Curious, they drew closer and saw that it was a woman who looked to be in her thirties, seated at a bench with a painting and an arts easel. She called out to them in a monotone voice, like an automated voice one would hear on an answering machine. As they biked closer, they saw that she was wearing what my cousin describes as “gypsy clothing,” colorful and mismatched thrift store attire. Her expression was entirely blank; she stared through, rather than at them, as if they weren’t even there. She began to ask them generic questions like “Who are you?” “Where are you from?” What are you doing?” etc., in her monotone voice. Her movements were stiff and awkward, her eyebrows and lips appeared painted on, and her skin was like plastic; in short, she was like a mannequin come to life. The painting she was working on portrayed the night sky, occupied by the moon and stars, each with faces showing different expressions. The two kids felt a sense dread that grew and grew, their instincts telling them to depart as soon as possible. So, they did. They rode their bicycles a brief distance away and then returned shortly thereafter, to see if she was still there. She and her art set were gone without a trace. Looking through the surrounding sidewalks revealed no trace of her either. This is odd for a number of reasons. First, she was barefoot, with no automobile or bicycle nearby. If one had come by to pick her up, they would have seen and heard it. Second, she had a large and cumbersome art set with her, which would have been an awkward impediment to carry by hand. Third, they were gone for less than a minute, scarcely enough time for her to depart the park. This incident bothers my cousin to this day. In the summer of 1995-1996 (I can’t recall which), my father and I (37-8 years old and 7-8 years old at the time, respectively) were fishing in a wooded area. This had been fruitless and the sun was about to set, so we entered his vehicle and departed. As we pulled away we turned to the side and saw a woman on horseback in traditional riding garb (red coat, white pants, boots, etc.). She stared at us angrily, as if we were intruding on restricted land. We pulled forward and then looked back and she was gone without a trace. Confused and unnerved, we left immediately after. This was bizarre for a number of reasons. There is no, nor has there ever been, a stable in the area, and owning and riding horses is a hobby well out of the price range for most locals. The specific stretch of woods we were fishing in has no clearings, no paths, etc. for a horse to walk on. Most curiously, the woman and her horse were completely silent; if they had retreated back into the woods we would have heard the sound of hooves clapping, but we didn’t. This mode of existence, I believe, is why religions invented the term/concept of “spirit” and its derivative terms. In the first story, the human-looking-but-not-human figure resembles accounts of men and women in black. The “woman” is all off in her appearance and mannerisms, which do not make sense. She seems artificial and acts in a robotic way. There is a faint alien/ET association about her through the celestial art she has. She is out of place, and disappears all too quickly. The witnesses are filled with dread, a common reaction in encounters with MIB/WIB, Black-Eyed Kids, and other weird beings. One explanation is Djinn, who are known for their shape-shifting and penchant for being tricksters. They are thought to be a form of plasma, and their characteristics fit points A and B made by Anonymous. Another explanation comes from the work of John A. Keel, an expert on high strangeness. Keel coined the term “ultraterrestrial” to describe entities of unknown origin but indigenous to the earth. I believe most of our entity encounters involve such beings, rather than beings from off-world. There is another question, however, about this and similar experiences: is there any difference between “Djinn” and “ultraterrestrial”? Perhaps “ultraterrestrial” is but one of many terms applied to phenomena created by the Djinn. In the second experience, the woman and horse seem to be ordinary, but strangely out of place. Perhaps this is a time slip case. The woman and horse had a bleed-through from the same location at another time, most likely during the automobile era, because she does not seem shocked or stupefied to see the car. Rather, she might have come from a time when autos were not allowed there, and thus the father and son were the intruders in her eyes. In reported descriptions of time slips, there often is a cessation of all sound, including environmental noise. The woman and her horse were silent, and perhaps they slipped back into their own timestream.